Kimpton Schofield Building is a much-loved landmark in downtown Cleveland where pride infectious warmth and passion abound. 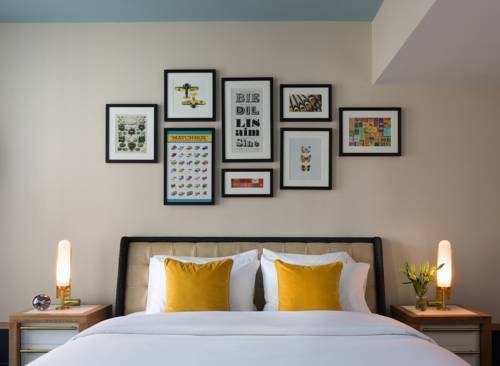 Cleveland is in the midst of a Past meets present at Kimpton Schofield Hotel; where a circa-1902 building houses a space that is reflective of the citys newest chapter. Think boutique; artisan elements like ottomans crafted from recycled saris paired with thoughtful touches that celebrate Clevelands heritage such as the lobbys collection of American Splendor comics. Given the location within walking distance of world-class theater sports stadiums and more there is no better place to base yourself. Kimpton Schofield building is in the heart of Clevelands business district on 9th and Euclid within easy access to popular landmarks and attractions like Quicken Loans Arena and the Rock and Roll Hall of Fame. Its in a prime location to experience everything Cleveland has to offer. We like to use local ingredients that help us distinguish and celebrate our cities food heritage. We pride ourselves in working closely with our local suppliers to ensure that only the freshest ethically-sourced seasonal foods makes it into our kitchen. The Levi Ballroom can accommodate up to 250 seated guests an up to 250 for a reception.